Discussing the concept of redemption of the Jewish people can be problematic, at least for those who take the idea seriously, for a variety of reasons. First of all, there is always the possibility that people will be misled and make faulty decisions. This happened during the time of Shabbtai Tzvi, the false Moshiach of the 1650s. He built up hope of redemption only to dash it when he converted to Islam at the threat of death. However, in the meantime Jews all over Europe made irreversible decisions about their futures, which cost many dearly once the truth about Shabbtai Tzvi became known. This means that a Jew must live with the belief that Moshiach could come at any moment in time. Believing in a specific date can prevent a person from expecting Moshiach earlier than that date, a violation of the principle of “anticipating him any day.” Failure to believe this, says the Rambam, can give such a Jew the halachic status of a heretic (Hilchos Melachim 11:1). To help with such “preparation,” this booklet has been prepared. There is another, perhaps even more disturbing pattern to Jewish history than incorrect predictions about redemption. In almost every exile the Jewish people have entered, going all the way back to the origins of the nation in Egypt over 3300 years ago, the pattern of sojourn has been practically the same each time. At first, we arrive humble and poor, and somewhat aloof as a people. However, over time, we adapt to our foreign host societies, and even master their skills and ways of life. This in turn leads to unusual success and upward social mobility amongst our gentile hosts. Success and intermingling with non-Jews then results in mass assimilation and wide-scale abandonment of Torah values, including the need to yearn for redemption. Even loyal Jews, over time, cannot help but be effected on some level by the non-Torah world in which they are enveloped. Anti-Semitism increases. Persecution against the Jews multiplies and the previously unthinkable becomes acceptable as Jews begin to realize TOO LATE that life can no longer return to what it once was in better times. Again, the Jew is a victim and pays a heavy price for it (see, “Anti-Semitism: The Causes and Effects of a Prejudice,” Citadel Press, 1979). We have lost millions upon millions of Jews throughout three millennia of history this way. And, those who did survive often had to re-locate to another, (temporarily) safer part of the world, poor, broken, and humbled. Thus the publication of this booklet. If there is “writing on the wall” we ought to be able to learn how to read it. If God is talking to us through the events of today, we should learn to understand His messages. These are confusing and troubling times which are changing dramatically by the day, if not by the hour—and NOT in favor of the Jewish people. Imagine two people meeting for the first time who strike up a casual conversation. Most people know not to ask personal questions early in a relationship, and even if they don’t, most people won’t answer them. Conversation in the beginning of a relationship is usually superficial, though honest. However, to draw anything but superficial conclusions at that point would lead to inaccurate perceptions of one another. If the relationship really flourishes, secrets start to emerge that complete the picture, a picture that in the end is often quite different from the one that first emerged. It may take years before this happens but once it does there are fewer “surprises” in behavior. This idea is true of life itself. In fact, the rabbis speak of four levels of understanding with which to relate to a single idea. They range from the simplest possible explanation to the most sublime accessible to the human mind. Knowing this has tremendous implications on how we view the events of history. In Hebrew, the names of the four levels are: Pshat, Remez, Drush, and Sod—Simple, Hint, Exegetical, and, Secret. Pshat is the simplest, most basic explanation of the idea; Remez alludes to deeper implications that are not at first obvious; Drush usually implies a traditional understanding of a concept that, perhaps, can be traced back to Moshe at Mt. Sinai. Sod is the Kabbalistic explanation of the same concept. Kabbalah teaches that unification with a concept occurs only as one delves deeper into it. Concepts with which we unify become the basis of our perception of life, and how it ought to be lived. Striving to know the “soul” of an idea is the way that we come to know our own soul better, which is what Torah learning is all about. 2. What are the implications? 3. What story do they really express that is not so readily available to the human eye? 4. What does it represent, Kabbalistically speaking? It is common for people to think that the simplest explanation of an idea or event is also the most accurate explanation. However, as we shall see, God willing, this is not necessarily so. Truth is often found not in generalities, but in the details of life. And, usually, the more profound the detail, the closer it is to an expression of truth. To view the events of one’s life and history on a simplistic level is not only to misinterpret them, but to leave one vulnerable to surprise and shock. On a pshat-level, history is nothing more than randomly unfolding events that occur because of some kind of historical dynamic that we cannot control. However, if a person pays attention to life and its nuances, certain clues and patterns emerge that suggest, on some level, that life is not as random as it seems at first. Certain curious details become clearer and suggest that there is a thread to history that might be there for some reason, to accomplish some purpose. The implications of this are very heavy. All of a sudden, the events of our lives are no longer random or meaningless. In fact, they might even be messages of some sort though, on this level, it might not be clear from whom or why. To make that leap of understanding one must climb to the next level of understanding: Drush. On the level of Drush, which literally means investigation, more clues and more patterns emerge. Like for the scientist who studies randomly occurring phenomena, or the doctor who wants to better understand the nature of an illness or its cure, investigation reveals and yields new direction and the formulation of rudimentary rules. Sometimes this is only possible when there is previous information; sometimes it is the result of hard work, deep thinking, and an active imagination. Whatever the component, the information that emerges can be enough to change the direction of an entire society. The Sod of life is nothing less than the very axioms upon which creation was Divinely constructed and which dictate what must happen, and when. It is the sublime knowledge of the built-in Divinely created cause-and-effect relationship governing creation. Sod is the expression of the purpose of creation as seen through the myriad of details that make up every last aspect of the world, that which we can see and that which we cannot. It is a Divinely given, Divinely approved peek into the programming of creation so that we, mankind, can work closely with God to bring His Master Plan to completion. It is, therefore, the most ACCURATE version of reality that exists—the TRUE pshat about everyday existence. Therefore, it is such sources of information that form the foundation of this entire presentation. However, not all of Kabbalah can be, or should be accessible to the masses, especially those ill-equipped to appropriately relate to its sublime wisdom. Nevertheless, perhaps, some ideas must be taught on all levels, for they provide certain key concepts that can result in the saving of countless Jewish lives. One of the most prominent questions asked by people who think about the situation is, “What does God want from us now?” Obviously He wants us to learn Torah and perform mitzvos as much as possible and with as much pure intention as we can muster, but is that it? Obviously He wants as many secular Jews as possible to come back to Torah, and as many religious Jews as possible to rid themselves of as many negative influences as possible. But, is that it? It was taught in a braisa: Rebi Yehudah says: In the generation of Moshiach, the “Bais HaVa’ad” will be a place of promiscuous behavior. The Gallil will be destroyed and Gavlan will be demolished. The people of the border will travel from city to city and find no grace. The wisdom of the scribes will be corrupted, God-fearing men will be despised, and the faces of the leaders of the generation will be like the face of a dog. The truth will be lacking, as it says, “The truth will be missing” (Yeshayahu 59:15). What does the expression “ne’ederes” (missing) mean? It was said in the college: they will form into various groups (adarim) and disappear: He who leaves evil is regarded as foolish (Yeshayahu 59:15). At the school of Shilah it was explained to mean that he who turns away from evil will be considered foolish in the eyes of the people ... Rebi Nehorai taught: In the generation of Ben Dovid, the young will whiten the faces of the elderly and the elderly will rise before the young. A daughter will rebel against her mother and a daughter-in-law against her mother-in-law. The generation will have the face of a dog; a son will not be ashamed before his father. Rebi Nechemiah says: In the generation within which Ben Dovid will come, brazenness will increase and respect will be missing. The vine will produce abundantly, yet, wine will be expensive. And all the governments will turn to heresy. Criticism will be of no avail. This helps Rebi Yitzchak, who says: Ben Dovid will not come unless all governments will have turned to heresy ... Ben Dovid will not come until informers increase. Alternatively, until the students are reduced. Alternatively again, until the pockets will be empty of a single coin. Alternatively again, until they will relinquish hope in redemption, as it is said, “And none is saved or assisted,” as if to say, there is no one upon whom Israel can depend ... (Sanhedrin 97a). This idea, together with the Zohar’s explanation that Kibbutz Golios will last forty years (Midrash Ne’elam, Toldos 139a), the same amount of time the Generation of the Desert wandered in the desert, implies that the final generation at Moshiach’s time will be a tikun for the first generation. Whatever Dor HaMidbar (Generation of the Desert) didn’t do right, Dor HaMoshiach will have to rectify. Very ironically, Torah Jewry has long referred to America as “The Midbar.” In fact, when after the Holocaust Rebi Aharon Kotler, zt”l, had to decide whether to leave Shanghai for Eretz Yisroel or America, he did the famous “Goral HaGra” (Lottery of the Gra, that is, the Vilna Gaon). Thus he “randomly” opened up a Chumash and let Divine Providence decide which page in order to communicate an answer through a relevant verse. It is hard to believe that such a great rabbi, young though he was at the time, would decide his post-war fate relying solely upon this supernatural process, especially given his vast Torah knowledge. More than likely it was not the only basis of this crucial decision, but that is not what concerns us here. AHARON Kotler, GO TO MEET MOSHE, that is, Rabbi Moshe Feinstein who was waiting for him there IN THE WILDERNESS, that is, America. And so Rabbi Kotler went to the “desert,” called so because it was barren of Torah at that time and was a virtual spiritual wasteland from a Torah perspective. Together with Rav Moshe Feinstein, zt”l, he laid many crucial foundations upon which Orthodox Jewry in America is built and thrives. His work is legendary, and in retrospect, it had clearly been the correct decision for the future of the Jewish people. And, should a Jew say today, “Well, it may have once been a desert, but today America is a Torah paradise, teeming with yeshivos, synagogues, kosher food, and beautiful mikvaos, he should recall how the desert also bloomed for the Jews at Mt. Sinai over 330 years ago, and everywhere they traveled for that matter. Yet, in spite of the IDEAL Torah environment of Mt. Sinai, the Jewish people were sent off to Eretz Yisroel. In spite of the fact that the Generation of the Desert never had to worry about parnassah (livelihood), attacks from foreign nations, or other distractions from learning, as long as they remained in the desert and enveloped by the Clouds of Glory, they were still sent to live in Eretz Yisroel. The question is why? To be “sandwiched” between Torah and the World-to-Come is quite a compliment for Eretz Yisroel. However, if the Talmud is listing the three Godly “gifts” according to importance (which is what it normally would do), one might have placed Eretz Yisroel first, implying that it is the least important of the three. Why did it not? Torah leads to Eretz Yisroel, and the two of them lead to the World-to-Come. If you love Me, then you will love Torah; if you properly love Torah, you will come to love Eretz Yisroel, for that is where you can best show Me how much you trust Me and want to be close to Me. There are many other similar references showing the importance of Eretz Yisroel to God, in Tanach and throughout the Talmud, as well as in the countless volumes of rabbinic literature. Jews living outside of Eretz Yisroel have to understand that yearning to live in “God’s Palace” —whether, practically speaking, one can or cannot actually move there—is also the yearning to be close to God. Granted, God has “embassies” of Torah around the world, places of Torah learning that keep Jewish communities spiritually alive and fulfill a crucial purpose at this point in history. Furthermore, there are still many mitzvos that justify Jews living outside of Eretz Yisroel, and will continue to do so until Moshiach finally comes and signals the final end to the final exile. Nevertheless, Jews outside the Land have to understand that yearning and living for redemption, no matter where in the world one lives, is synonymous with loving the gift of Eretz Yisroel, as well as Torah and the World-to-Come. They are inseparable, and together they bind the Jew to God, and can even give a Jew a philosophical status of being a B’nei Eretz Yisroel from Heaven’s point of view while still living outside the Land. God knows a person’s heart. He knows a person’s true intentions. First and foremost, the Jewish people are about Torah and mitzvos. First and foremost, the central crisis facing the Jewish people today is continuing wide-spread assimilation and rampant inter-marriage. First and foremost, those who can must work to rectify this catastrophe as soon as possible while at the same time strengthen those who are committed to a Torah way of life. For, there are still millions of Jews around the world who do not accept the Divinity of Torah and our obligation to uphold Torah to the best of our ability. Still, more than fifty-percent of the Jewish population today inter-marries. This is a crisis of frightening proportions, and reason for extremely serious concern for the entire nation. And, even within communities with a connection to Torah, there have been serious breaches that need repair. However, at the same time, it is clear that a central issue affecting the Jewish people today—on all levels of observance—is Eretz Yisroel. It is at the forefront of the news, and even people who never used to discuss life in Israel and its future are being “dragged” into the discussion. History is forcing the issue and creating concern for the security of the land and the people who live here. However, though exile is something that is imposed upon us against our will, Eretz Yisroel and redemption are not. They have to be chosen, as a result of a Jew’s yearning for closeness to the God of Torah. If Israel was the most attractive country to live in physically speaking, there would be little, if any, free-will at all involved in moving there. Therefore, historically, God has often made Israel look unattractive physically, but extremely attractive spiritually. If we are a people which thrives on learning Torah and performing mitzvos as a way to allow us to feel the Presence of God more, then there is no better place to accomplish that than in Eretz Yisroel—for the Generation of the Desert then, and for our generation today. However, choosing to love Eretz Yisroel today, and maybe even live there, is somewhat easier after the attack of September 11 than it was prior to the attack. History has taken care of that, and with each passing day it may become even more attractive for many Jews around the world than it has been for decades, maybe even centuries. This, of course, reduces the free-will choice involved in making such a decision, and therefore the eternal reward for making it. It is also highly significant how good America is, which is one of the reasons why even Torah Jews have become so attached to the land. The American Constitution borrowed from the Jewish Bible. To this very day the currency carries the name “God” (something quite remarkable in this day and age for such a modern nation as the United States), and America does a phenomenal amount of charity work around the world. On the other hand, America has a lot of evil as well, and we’re not just referring to crime. Sections of the population of the United States indulge in activities considered to be blasphemous and repulsive by Torah standards, even for non-Jews. This is the part of America that Torah Jews try to avoid and often overlook. What makes all of this so significant is that of all the days of creation, Day Six is the only day that we know what happened during each hour of the day, from the first hour that Adam was created to the last hour just before the first Shabbos. When it comes to Day Six, according to the Talmud, we know what happened and more importantly when it happened (Sanhedrin 38b). This includes the event that has had the greatest impact on all of mankind: the eating from the forbidden Tree of Knowledge of Good and Evil! The Talmud is telling us that, on Day Six, in the ninth hour, God warned Adam not to eat from the Tree of Knowledge of Good and Evil. In the tenth hour, the Talmud continues, Adam and Chava went ahead and ate the Forbidden Fruit. What is the period of history that corresponds to this fateful moment in the history of creation? —or, 1991 to 2073 CE—precisely our period of history! It is now the year 5762, twelve years since the year 5750 and the beginning of the period of time that corresponds to the tenth hour of Day Six of creation, the hour that changed all of mankind until Moshiach comes. One would expect the tikun (rectification) to have to be in a modern-day version of the Tree of Knowledge of Good and Evil. However, what could be a modern-day version of the Tree of Knowledge of Good and Evil? There is, was, reason to believe it is the Internet, which actually entered history in the year 1990—the precise beginning of the “Tenth Hour” of “Day Six” of history! However, perhaps, there is even greater reason to believe that America itself is this, being a tremendous source of good ideas and bad ideas; of good culture and evil culture—all combined together within one country. If true, then this only compounds the challenge facing American Jewry today, and everything else that is happening is only occurring to make Jews choose. In the posuk, the word “rise” comes before “and this people,” so, technically, it can refer to Moshe himself, or the people who are spoken about next. That is, just after life sets for Moshe in one generation, it rises again for him in the next. Sefer HaLikutim, q.v. Vayareh Hashem ki … The souls of all three emanate from the same high place, which is why, the Arizal explains, Moshe was so insistent to take them out of Egypt at that time. See also Drushei Olam HaTohu, Part 2, Drush 4, Section 12:9, where it is presented as a matter of fact. To where he had miraculously escaped during the war from Mir, Poland. According to many commentators, the spies wanted to remain learning Torah in the comfort of the desert because of the miracles that happened for them there on a daily basis. Living on the land would mean an end to most of those miracles, and having to have more trust in God. Even historically Eretz Yisroel was given to Avraham before the Torah was given to his descendants hundreds of years later. Since God only created during daytime hours, the Kabbalists disregard the nighttime hours with respect to this calculation (Dayah 2:301b). The fractions have been either rounded up or down, depending on whichever was closest. Throughout Jewish history, there has rarely, if ever, been a single group of Jews. It was no different in the desert either, where a large number of Jews rejected the report and advice of the spies and chose to live in Eretz Yisroel, and eventually did. —and the Levi’im, who are famous for their devotion to God and their desire for relationship to Him. Today, the Jewish people also seem to be divided into two parts, with approximately 6,000,000 Jews living in the United States of America, and about 4,000,000 Jews living in Eretz Yisroel. In other countries where Jews can be found the numbers are usually much smaller, and the ideologies are often Western in nature. However, there are a good many Jews living within Israel today, especially those who have left other lands and have made aliyah (if not technically at least psychologically), who are here to be closer to God and to give greater reality to their Torah learning and mitzvos. In spite of the attitude of many of their fellow Jews towards Eretz Yisroel today, and any hardships they have thus far encountered living in the Land, they hold Eretz Yisroel dear in their hearts and living there, extremely important. They have chosen Eretz Yisroel and all that it stands for already. If so, then what is their test at this late and explosive stage of history? However, He HAS forsaken the Land on a few occasions, and that is what worries those who worry in Eretz Yisroel. We have been exiled from our land before and forced to flee; how do we know it won’t happen again, even if only one more time before Moshiach finally does come? I wish I could answer that question with certainty—for myself, for my family, and for my fellow Israeli Jews. However, we are not yet privy to such information because free-will is still an issue and therefore, such matters must remain a matter of opinion rather than fact. A close friend of mine, when discussing this point one evening told me that he was once driving Rabbi Simchah Wasserman zt”l, during the time of the Gulf War and the threat of Iraqi Scud Missiles. When asked if Rabbi Wasserman believed that the war could bring great destruction to the Jews of Eretz Yisroel, he answered that he could not believe that God would allow the Jewish people to build up Eretz Yisroel just to destroy it later. Like Rabbi Kahaneman before him, history vindicated his trust in God; there are books that write about the tremendous miracles that happened to save both Jewish lives and property at the time. Even before I heard this comment, I thought the same thing as I walked home one afternoon through my beautifully renovated community. As I take buses through Yerushalayim and see all the new buildings that have gone up in the last two years alone, I find it hard to accept that God is just going to let the missiles fall and reduce it all to rubble once again. In some places, there is another new yeshivah or synagogue every block. Some are magnificent structures, exuding the royalty of Torah and love of holiness. Will God allow them all to be wiped away by evil dictators? However, Eretz Yisroel is not Europe, and, 5762 is not 5700. It is an entirely unique period of Jewish history. In 1939, there were still places in the world where Jews had yet to live, at least in significant numbers. Today, we have nowhere else to go but home, to Eretz Yisroel. Perhaps one of the most compelling points is just how late we are in history, as discussed in previous chapters. If it is true, as the Zohar and other commentaries write, that Resurrection of the Dead must begin by the year 5790, or 2030 CE, then that leaves only 28 years for history to wrap itself up. However, even 28 years is a lot of time, or at least it was until the Oslo Peace Accord fell through at the start of 5761, and the United States quite suddenly found itself in the midst of a vicious war at the end of the same year. There seems to be a major shift in world politics in the direction of people who do not have Israel or the West in their best interest. And, they have bundled their war with ours, forcing the Americans, the last human ally of the Israeli people, to rethink their policy with respect to Israel and the Palestinian conflict. It has become a no-win situation for the Jews here and in America, and it is getting undeniably worse. We hope the situation will get better, and we even live as much as possible as if it will. However, at present, there is no amenable solution to the conflict between the Jews and the Palestinians, nor between the Americans and the Afghanis. Even should the Americans succeed at their war against terrorism and bring Bin Laden to trial or death, will that end the war? Is it not likely to even further destabilize the already unstable Islamic world, which tends to make martyrs out of the enemies of the Western world and declare Jihad at every chance they get? The American fighting machine is up against an enemy it does not understand and cannot stop. Is this what we are experiencing now? Is that what the events of today are actually leading towards? Is Biblical prophecy finding fulfillment in modern-day society? It is too hard to believe that the answer is YES, but not because we know that it isn’t, but because we don’t know that it is. We are scared to commit in case we are wrong and scared to be wrong in case we don’t commit. If the answer is yes, then we simply “turn on” our faith and trust switches and peacefully go with God. We may not remain oblivious to the world situation, and we may even be forced to dramatically alter our daily lifestyles. However, we must not panic, but rather, always function within a Torah framework as per the changing situation. We do this by graciously accepting and LOVING His three gifts to the Jewish people: Torah, Eretz Yisroel, and the World-to-Come. And, above all, making closeness to Him the most important matter on our personal and national agendas. This is from Balak’s prophecy about the End-of-Days. Rome? Ancient Rome fell over fifteen hundred years ago, and nothing like this has occurred to modern Rome. And why should it anyhow? However, historically, all modern nations can trace their roots back to ancient peoples, and all modern-day philosophies can find their roots in ancient philosophies as well. The city of Rome may remain today in Italy, but the concept of Rome can be anywhere else in the world today, in part or in whole. Even New York City—which is the implication of those who try to read in the above-quoted passage a reference to the blowing up of the World Trade Center (“three great walls”) and Pentagon (“great hall”) on September 11 of this year— which happened to have also been the twenty-third day of the sixth Jewish month, Elul. 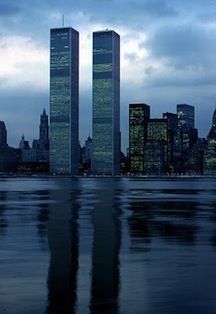 It was a horrible act of terrorism, and almost six thousand innocent people were killed that day. American confidence was severely jolted as well, and the world’s economy took another big blow. And now, a new war has begun that could easily result in a world war, to no one’s benefit. What difference does it make to look for an ancient source for a modern catastrophe, and a somewhat vague one at best? In the year 1656 from creation, or 2105 BCE, there was a major flood that wiped out the people of that time, save for Noach and his family and a small animal kingdom. For forty days and forty nights it rained, and for 150 days waters surged from the depths of the earth to rid the world of the evil of mankind. However, it took Noach and his sons 120 years to build that Ark that was to be their home and source of redemption from the flood waters for an entire solar year (Bereishis Rabbah 30:7). And, they were forced to build it in full view of all the people of their time, who mocked them to no end and disbelieved their warnings of the impending flood. The rest is history. The Great Flood came, man was washed away, and Noach and his family were forced to begin mankind anew one year later. However, there are important lessons to be learned from then that are certainly applicable now. Amalek’s tactic makes people doubt in the reality of God and His hand in the affairs of man and specifically that of the Jewish people. Amalek comes specifically to sever any connection between the will of Heaven above and the events of earth below. Perceived randomness destroys the meaning of history and denies a person the opportunity to learn from his mistakes and turn his heart back to God. This perception makes the attack on the World Trade Center and the results random, planned and carried out by terrorists, but devoid of any Heavenly meaning. The Flood waters, we are told, rose above the highest mountain fifteen amos (about 30 feet), while the Ark listed down in the water eleven amos (about 22 feet; Rashi, Bereishis 8:14). Why do we need to know this information; what difference does it make to history to know how severe the devastation was at that time? The numerical value of Yud-Heh, the section of God’s Holy Name that corresponds to His revealed and perceived Presence, is fifteen. The numerical value of Vav-Heh, the part of the Name that corresponds to the hidden hand of God that works through nature, is eleven. This is why the fifteen “ascended,” while the eleven “descended,” indicating a split in the Name while the two sections moved in opposite directions. It was the measure-for-measure punishment against the Generation of the Flood, whom, through their everyday beliefs, acted in the same manner. For, the point of the Ark and the other “natural” changes to history they witnessed was to be messages from God to wake up and change their ways of life. However, given the choice to ascribe the subtle messages to God or to nature, they chose the latter, pushing the hand of God further away in their minds. Are we doing the same thing today, as we always have throughout history? The attack on the World Trade Center and Pentagon is history now. Why some people were late for work that day and others were not, is understood only to God’s Heavenly Court. That a great evil was perpetrated that day, and that God cries over such tragedies is without question. However, is it a message from Heaven? In spite of all that, can the tragedy of September 11, particularly since it was SO surreal, still act as a Heavenly message, specifically for the Jewish people? A prophet could tell us yes or no with certainty and take away our free-will choice in the process. The Zohar and our own interpretation of events and historical context can only do so with uncertainty, leaving room for us to make up our own minds, and to make our own choices. Maybe New York City is a modern-day Rome; the comparison has been made before. Maybe the three towers that fell were the three walls mentioned by the Zohar. And just maybe, if indeed we are entering the time period our rabbis of the past believed in without any doubt—Yemos HaMoshiach—we should ready ourselves to the best of our ability. Another very important lesson to learn comes from the dove that Noach sent out at the end of the Flood to determine if dry land had reappeared. It is a crucial lesson for Jews who are just now learning how to properly relate to redemption and Eretz Yisroel. Don’t forget what led to the downfall of mankind and brought on the Flood! It was man’s insatiable need for physical pleasure, as if such pleasure was a goal unto itself. The goal of creation is to be close to God, to be like Him, even if it means sacrificing physical comfort and pleasure. Physical pleasure is merely a wonderful by-product of living in This World, not a goal. It’s the relationship to God that counts in the end, and a person has to be willing, in This World, to suffer discomfort sometimes to enhance it. We do it all the time as humans relating to humans; we have to do it as well as Jews relating to God. It is for this that we are rewarded in the World-to-Come and even in This World. And it is only THIS that will save us from any further travails and pangs of the birth of Moshiach. It will allow us to bring him earlier and in peace, rather than at the last possible moment, and through war and suffering. Elsewhere, the Leshem explains that from the beginning of the period miracles will be commonplace and overt, though nature will still remain, as was the case for the Jews in Egypt. For, even though the hand of God had become eminently revealed, still, basic human needs had to be fulfilled. However, as time progresses until the end of the forty-year period of time, miracles will increase and nature will become reduced. What seems impossible to us today will become commonplace then, and prophecy will return. With the yetzer hara chased from creation (Succah 52a), nothing will stop those living at the time from achieving unimagined levels of spiritual greatness and closeness to God, most of which will be the result of a person’s yearning to achieve such growth at this time of history. What better way to describe the indescribable? What better way to imagine the unimaginable? Like dreamers—people who have awakened from an unpleasant sleep to the realization that the true reality is safe, pleasant, and eternal. Let our eyes witness Your return to Tzion in mercy. Blessed are You, God, Who returns His Presence to Tzion. Amen. May we merit it soon in our days. The Abarbanel, based on Yalkut Shmoni in the compilation Mashmia Yehudah writes: The children of Yishmael will approach Rome and will destroy it… and then Moshiach, the son of David, will be revealed… and God will complete His redemption. As Daniel wrote regarding this, “and in that time your nation will be saved.” And at that time there will be a great war in a big city of Rome, and from there the Son of Dovid will arise, and will enter the Land of Israel. According to some commentators going back hundreds of years, the text should read “twenty-third day” instead of “twenty-fifth day,” since the latter can never fall out on a Friday, the sixth day of the week, because Rosh Hashanah, the first day of Tishrei never occurs on a Wednesday (Nitzutzei Oros). This was also the difference between the blessing conferred upon Ya’akov as opposed to the blessing that Eisav received, as Rashi points out (Bereishis 27:28). Ya’akov’s success always depends upon his closeness to God and his loyalty to Torah, whereas Eisav can be successful regardless of his moral behavior, at least to a point. This is why Ya’akov and his descendants can merit the World-to-Come, whereas Eisav’s descendants are not guaranteed a place in Eternity. Seventeenth blessing of the Amidah.